Drexel's MS and PhD level graduate programs in Digital Media are available for students and professionals who are interested in exploring, researching and building advanced media design and production careers. The programs reflect the fast-paced, constantly evolving field in which art, technology and science intersect and are based on an innovative, interdisciplinary and project-oriented curriculum. The MS in Digital Media is a hybrid program created to offer students research as well as career opportunities in 21st century media applications. This two-year program offers comprehensive studies in advanced digital design including 3D modeling, animation, interactivity, gaming and digital media history, theory and methods. The curriculum for the MS in Digital Media offers a mix of academic course work and project-related activities. Projects consist of funded grant research opportunities, industry-sponsored projects and independent, student-generated and faculty-approved projects. The Digital Media PhD program focuses on translational research in digital media within an experiential learning environment. It studies the application of digital media towards solving research problems in various disciplines including but not limited to engineering, education, cultural heritage, health or business. This doctoral program is built on a fundamentally interdisciplinary course structure and emphasizes an iterative and design based research philosophy. Students at the master as well as the doctoral level may participate in government-funded grant research opportunities, industry-sponsored studies, or independent student-generated and faculty-approved projects. Projects have included Brain-Computer Interfaces (BCI) for video games, a multi-media interactive dance performance with body tracking, multi-touch games for teaching middle-school children, theme park ride and animation design, interactive online non-linear narrative comics, and advanced animation production techniques. Graduates have obtained jobs at leading companies including Pixar, Microsoft XBOX, NCSoft, Dreamworks, and Disney. For additional information on scholarships, fellowships and admission requirements, visit Graduate Admissions. To see student work samples, visit the creative work page, www.digm.drexel.edu, and also visit replay.drexel.edu. 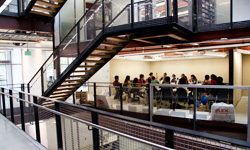 In addition to the MS in Digital Media, the Department of Digital Media also offers an MS in Biomedicine and Digital Media in collaboration with the Drexel University College of Medicine. For more information on this highly innovative new program, please visit the corresponding program pages at the Drexel College of Medicine website.